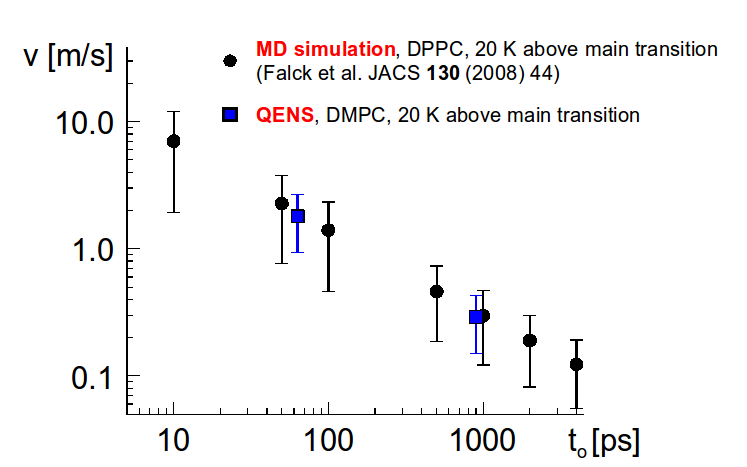 In our group diffusive motions of molecules within biological membrane mimics are studied in the pico- to nanosecond time range by QENS and MD simulation. The aim is to understand intra- and intermolecular diffusive motions and the mechanism of the long range lateral diffusion process. We started with a careful study of the motions of the phospholipid dimyristoylphosphatidylcholine (DMPC) on a pico- to nanosecond time scale with quasielastic neutron scattering (QENS) . A fully hydrated sample of the liquid crystalline phase of the phospholipid was measured at temperatures about 20 K above the main transition of the phospholipid. Under these conditions it was expected to observe a diffusion mechanism according to the proposed free volume theory. This theory was successfully used to explain a discrepancy of the diffusion coefficients by up to two orders of magnitude observed when measuring on long time scales by e.g. FRAP (fluorescence recovery after photo bleaching) and on a short time scale by QENS, respectively. It was assumed that on short time scales (as seen by QENS) the rattling motions of the molecules inside the cage of its neighboring molecules is observed. The jumps of the molecules out of their cages could be expected to become visible only on longer time scales (as seen by FRAP) and these motions then represent to a much slower relaxation process. These predicted jumps of molecules out of their cages could, however, not be observed by experiments nor by MD simulations. Instead, a smart analysis of MD simulations  lead to the assumption that it is not a jump out of the cage that represents the fundamental step of lateral long range molecular diffusion in the membrane but a highly dynamic flow like motion of molecular clusters which rapidly form and disintegrate. Mean flow velocities as a function of time calculated from MD simulations and QENS data, respectively. Both methods are in quantitative agreement. The drop of the mean velocity with time is due to the limited lifetime of the ‘flowing’ molecular clusters. Our QENS measurements on liquid crystalline DMPC represent the first quantitative experimental evidence for such molecular flows. As shown in Fig. 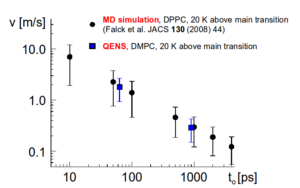 1, the results of the mean flow velocities found by QENS are in quantitative agreement with the values observed in the MD simulations by Flack and coworkers . Furthermore, it could be demonstrated that the observed dynamics are obviously of the same nature as the well known dynamic heterogeneities in glass forming liquids.